The breed is registered as a standard in the year 1996 as number 63 at the FCI. The breeding-club, Deutscher Brackenverein e.V., is a member of the Jagdgebrauchshundverband (JGHV) and of Verband für das Deutsche Hundewesen e.V. (VBH). The roots of the Austrian Black and Tan Hound (Brandlbracke) reach back to the Hounds (Bracke) of the Celts. In the mid of the 19th century directed breeding began. The breeds standards were defined in 1883 in Austria. So originally it is an austrian breed, which was mostly influenced bei Karl Barbolani and Herzog Ludwig Wilhelm von Bayern. to dark brown spots (in German this spots are called Brand, which causes the name Brandlbracke). The brown spots are located at the lower part of the legs and go from the inside of the legs up to the body, sometimes up to the breast. The mouth also shows this color from below to the sides. A must are the brown marks above the eyes, that causes the nickname 4-eyes (Vieräugel). On breast and throat there might be a white spot called Brackenstern, but this shouldn’t be to large. The body is craned up to a bit strong, but always showing elasticity. The breast is wide and downgoing and the body is going up at the loins. The ears are midsized, located high on the head and rounded down. The tail is lightly arcuated and on its downside with thicker hair. In rest the tail is drooping while it is more up in agitation.. The eyes are brown, clear and show an intent, intelligent and self-confident look. The joy of movement and an stretching, elegant walk are characteristic too. 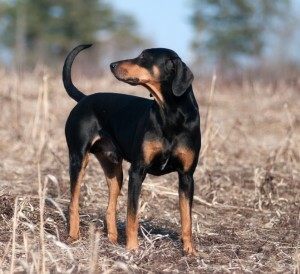 A pleasant character is another, outstanding feature of the Austrian Black and Tan Hound (Brandlbracke). Enough movement and activity by training and work are especially important , for a mentally stable dog with the willing to perform. 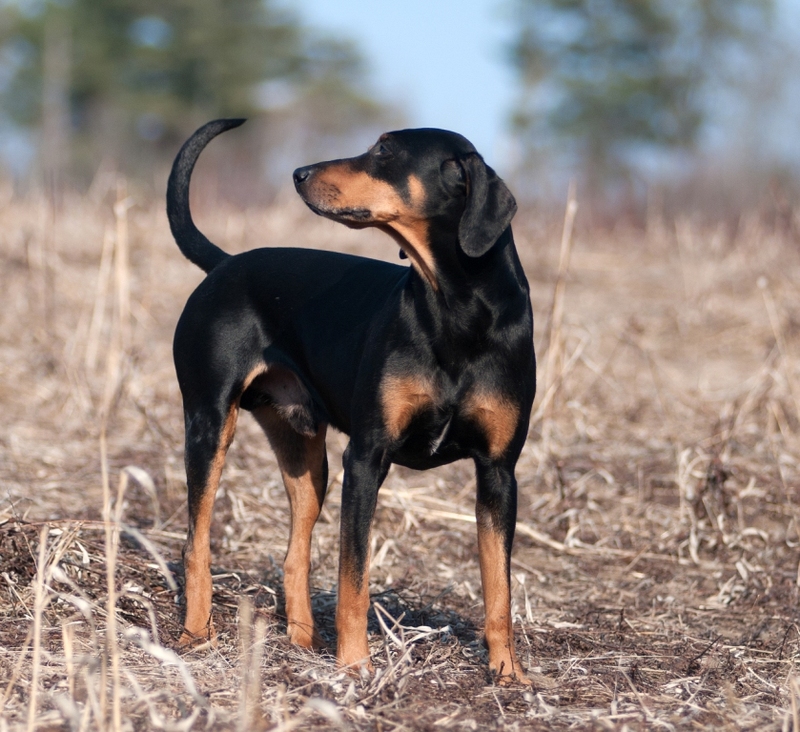 The Austrian Black and Tan Hounds (Brandlbracke) do not fit for staying in a kennels only. Being part of the family is mandatory. 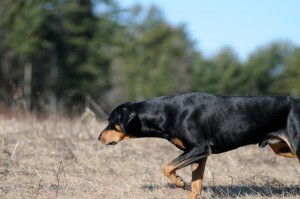 By the special characteristics of this breed it is characterized as a versatile hunting dog. In the first place is the lasting, reliable and loud hunting on tracke. Again and again hunters are enthusiastic bout the exceptional aptitude to search for game.. Especially in hunting wild boar, these dogs are in their element. An excellent sense of direction and beeing sure footed these dogs are qualified to work in the most difficult terrain. 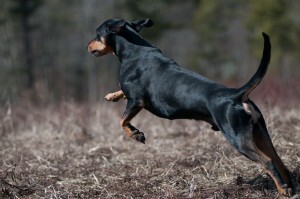 An Austrian Black and Tan Hound (Brandlbracke) normally always makes ist way back. The distinctive will to stay on the track combined with the bitingness lead to the special suitibility for blood tracking. That´s why many Austrian Black an Tan Hounds (Brandlbracke) are defined specialists for blood tracking. Here the absolute will to stay on track and the endurance of these breed are important.